Reigning BTCC champion Andrew Jordan has won the final frenetic encounter at Croft in Yorkshire, firing himself back into title contention in the process. Rob Collard finished second whilst Gordon Shedden closed to within five points of championship leader Colin Turkington after completing a hat-trick of podiums during the day. Jack Goff had started on pole position in his Vauxhall Insignia thanks to the reverse grid draw and pre-race penalties issued to both Matt Neal and Jason Plato. 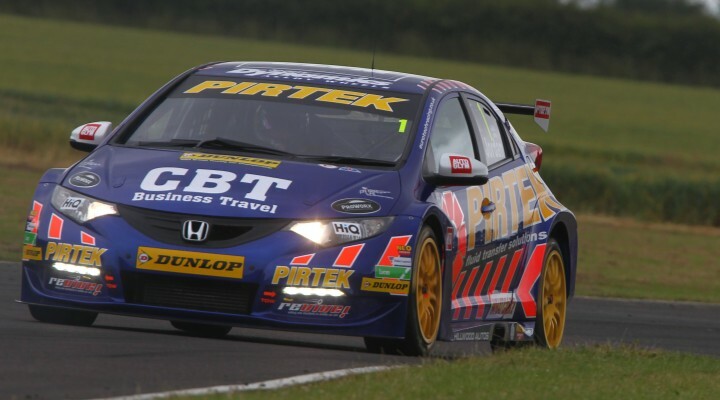 The former was excluded from the race two result after his Honda Civic Tourer failed a ride height test whilst the latter was relegated ten grid positions for his part in an incident with Alain Menu. Goff held on initially but slight contact with the Toyota Avensis of Tom Ingram on the exit of Clervaux scuppered his chances of a first win. Ingram retired later in the lap while Goff was able to continue in third. The Airwaves Racing Ford Focus of Fabrizio Giovanardi inherited the lead but he also failed to see out the first tour at the head of the field. Jordan made contact with the rear of the Focus at Barcroft sending his Italian rival tumbling down the order. After a brief safety car period it was Jordan’s turn to lead and despite extremely challenging weekends at both Oulton Park and here at Croft, the 25-year-old held on to claim the win. Goff had a gaggle of cars bottled up behind throughout and he eventually relinquished second to the eBay Motors BMW of Rob Collard, who’s team-mate Colin Turkington had already retired with clutch problems. Despite the Ulsterman’s impressive weekend, his non-finish in race three added to the fantastic third from Shedden after he too got by Goff, means the Scotsman is now just five points off the championship summit. Mat Jackson rounded off an encouraging day personally to take fourth ahead of the WIX Racing Mercedes of Adam Morgan, who got a run side-by-side with Goff across the finish line. With the result uncertain to the naked eye it was the timing screens that confirmed Morgan’s Merc had pipped the Insignia by an incredible 0.001s. Nick Foster took an eye-catching eighth ahead of a sensational comeback drive from the Swiss superstar Alan Menu, with his final pass of the day taking place when his Chrome Edition Restart Racing team-mate Aron Smith ran wide on the final lap. Matt Neal was trying to produce his own charge through the field after his race two exclusion but contact with Glynn Geddie’s Toyota halted his early charge. Even worse was to come, however, as a further incident involving his Civic Tourer, Rob Austin’s Audi and Warren Scott’s Vauxhall sent all three into the gravel at Clervaux. The latter was able to continue but both Neal and Austin eventually retired.